more stairs, more architectural sight-seeing, also found on pruned... a link to an academic paper about a new "sea organ" in zadar, croatia. too in-depth for me to want to read thoroughly, but a quick scan makes me to want to visit this new site that just opened back in spring of 2005. essentially, it is a series of steps that lead into the sea with pipes installed underneath... each pipe has a whistle attached, and as the waves rush under the steps the movement of the air creates a musical composition. 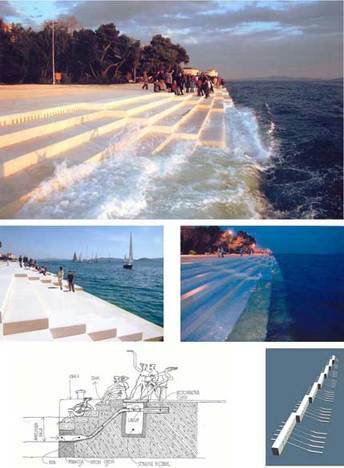 here's another account (from a funny little blog) of the zadar sea organ. hotel president. about 130 euros a night for standard single, with a very generic business-hotel look. since hotels in zadar proper seem rather unappealing to me, maybe the idea is to stay in the dalmatian coast region and make zadar into a side trip.... i have heard positive mentions of hvar, dubrovnik, and zagreb. in dubrovnik, the pucic palace looks amazing. in the island brac, in a town called bol, the hotel kastil looks simple and modern - can't beat the sea views, either. rates from 60 to 95 euros. the arcotel allegra, in zagreb, looks appealing... only 70 euros per night, for a boutique-style hotel. and i guess there's some variation on the sea organ in san francisco, a "wave organ", but it doesn't sound like it actually plays true music. here's roadtrip america's review of it. the zadar sea organ drives natives crazy.